Geometry2D nodes simplify creation of simple planar shapes, which can be helpful for billboards and user interfaces. Geometry2D nodes simplify creation of simple planar shapes. Planar geometry includes the Arc2D, ArcClose2D, Circle2D, Disk2D, Polyline2D, Polypoint2D, Rectangle2D and TriangleSet2D nodes. Each Geometry2D node is placed individually inside a Shape node. The supporting Chapter 10 slideset and course videos (NPS, YouTube) for X3D for Web Authors are available online via X3dGraphics.com. Arc Close 2D Example of ArcClose2D showing PIE or CHORD subsections of circular geometry. Circle 2D Example of Circle2D node showing a simple circular circumference. Disk 2D Example of Disk2D showing circular geometry with an optional center hole. Polyline 2D Example of Polyline2D showing multiple 2D line segments. Polypoint 2D Example of Polypoint2D showing a simple set of points. 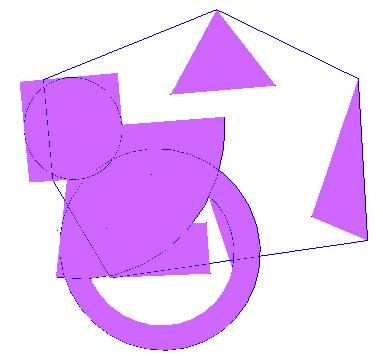 Rectangle 2D Example of Rectangle2D showing two simple polygonal shapes. Summary 2D Example of all of the Geometry2D nodes for the X3D Book. Triangle Set 2D Example of TriangleSet2D showing multiple simple triangle shapes.